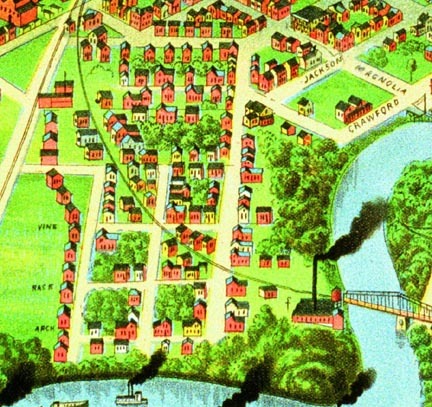 Frostown (also seen as “Frost Town”, “Frosttown”, and “Frost-Town”) was located within the large square-shaped bend that Buffalo Bayou makes not too far from Allen’s Landing – Crawford Street once dead-ended at Frost Town. It stands out on early maps of Houston, such as this 1891 map, because its streets are oriented at a different angle than other streets on the downtown side of the bayou. Street names included Spruce, Arch, Race, and Bramble Streets. Some current electronic maps of Houston will still locate Race Street running a very short distance off of McKee Street. The Frostown area was settled in 1822, years before the Allen brothers purchased the land that was to become Houston. However, it got its name from a family that bought land in the area from the Allen brothers in the late 1830’s. Before that, it was known as Germantown, because of the large number of German settlers (who started arriving in the late 1820’s), and both names may have been used interchangeably for some time thereafter. Frostown had its own post office, school, churches, and cemetery, and was home to a variety of thriving businesses. Notably, Houston’s first brewery was located in Frostown – it was started by Michael and Peter Floecke in the 1850’s, and appears on some Frostown maps. In 1865, though, a Galveston and Houston Junction Railroad track sliced the community in two. 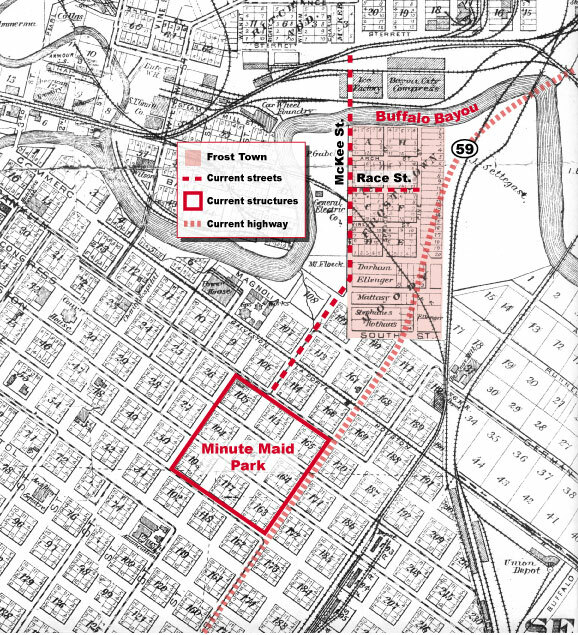 The small town suffered from the loss of its post office in the 1880’s, and the cemetery (the site of which has since disappeared into Buffalo Bayou) stopped being used about the same time. While many Frostown structures survived well into the next century, it had become a slum by the late 1930’s. 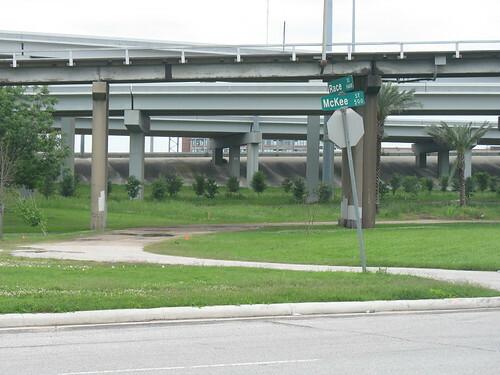 The Elysian Viaduct was built through the area in 1952 and, later, Highway 59 was also run through the once-vibrant community. A number of pre-1900 gable-roofed cottages were destroyed in the process. Despite the efforts of preservationists, the last remnants of Frostown disappeared in 1992, the victim of a freeway expansion project. The structures removed included a house that may have dated to the 1800’s. 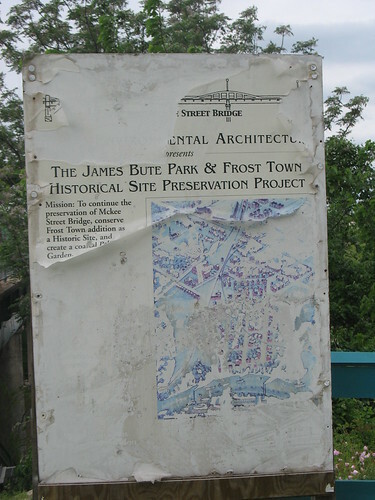 At the feet of Highway 59, James Bute Park now encompasses parts of the Frostown site. The non-profit organization Art and Environmental Architecture is working to acquire and preserve as much of the surrounding property as possible, so as to expand the park as an historical site. Aulbach, L.F., “Before there was Houston, there was Frostown,” Buffalo Bayou – An Echo of Houston’s Wilderness Beginnings (2001). Schafer, D., “The truth of a frosty town legacy,” City Savvy (Online Ed. 2005). This entry was posted in Breweries, Cemeteries, Downtown, Lost Houston, Other Places. Bookmark the permalink. Rebecca Peterson please email me at eddzoe08@yahoo.com its about the rudesill family. My grannys house,where my mom grew up, was one of the last two houses to remain until 1992.It was on rains st.
Was it the one on Brambel with a big oak out front..near 1820 Brambel the cypress wood frame house..the last one to go. Your house seems like it was maybe the one that was blue and had a cistern in the back of the lot. D. Medina’s house was taken early on Spruce..but it seems like the very old small Tony Vale house was one of the last to go as well. Not sure but I think the house was on rains st.my grannys last name was espinosa.she passed in 71 the year I was born. The address was 85 rains.it was the blue house with the cistern.my moms aunt lived at 1818 bammel.